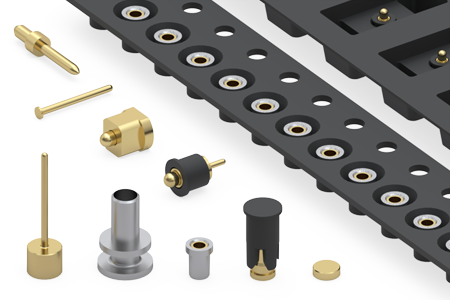 Mill-Max Mfg., Corp., North America’s largest manufacturer of Precision Machined interconnects is proud to announce expanded capabilities for packaging its pin and receptacle products on tape and reel. With the addition of new tape forming equipment Mill-Max is now fully integrated from tape pocket and tooling design, to manufacturing of the pockets and supplying parts on tape and reel. This vertical integration, one of the hallmarks of Mill-Max Mfg. Corp., can help reduce costs and lead times, while meeting the packaging needs of electronics manufacturers. These expanded capabilities allow Mill-Max to offer almost any of its discrete machined pins and receptacles packaged on EIA-481-D standard carrier tape. This includes popular products such as nail head pins in various diameters and lengths, spring-loaded contact pins, target pins and discs, or double tail pins and receptacles in any orientation for special applications. In addition, Mill-Max can now accommodate longer pins with the ability to draw deep tape pockets, or small diameter pins which put an emphasis on efficient loading of these thinner parts into the tape pockets. Finally, orientation of the pin or receptacle, either head up or down, can be addressed with specialized tooling design and packaging techniques. To help manufacturing and design engineers, Mill-Max has highlighted some examples of packaging styles in a new Application Note. This three-page document was written by Mill-Max Application Engineers to further explain some of the unique solutions to challenging packaging requirements.